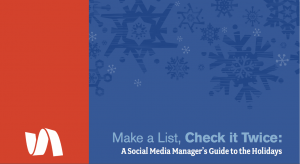 Benefit from the 12 days of Social Media Christmas with Social Selling from Robert and Daniel! Social media works best when content is kept fresh. Your customers may actually spend more time online during the holidays, and so might your competitors. And in the event of a crisis (or a rare opportunity), they’ll look to your social media for a response or statement. Take a look back: If you did social media 12 months ago, what worked? Schedule Posts in advance. I introduced you to the idea of the 12 posts of Christmas. What could be new and fresh? What would other blogger and journalists pick up on that they could use? People buy from people, show you are one! Keep it social and less of the selling! Monitor what you are going to tweet or post in case it could be embarrassing in light of news items. And monitor in case there is a crisis or opportunity! Is there a crisis plan just in case? Hint at good news in the new year, there must be some right? Where are people hanging out on Social Media, did you learn anything last year? Maybe they are more picture orientated? Family? Avoid the clutter, avoid where the empty vessels (or competitors!) are making most noise and annoying people, don’t me “me too” this time. We don’t claim to be the best, we are not even claiming to be “THE leading experts” in the field of social media and social selling. But we are Irish! Which makes us experts in being nosey, experts in knowing someone who knows someone, we are experts in selling, we are experts in understanding why people will buy and what they want to hear (usually their own voices not yours!!!). What we do is slightly different, we do not try to fool google, we try to present your business in terms that the likely customer is looking out for. Then we apply our experience in selling and get that out on the internet. We also combine innovative internet tools to generate actual leads for your business form the social media chit chat. We firmly believe, that we leave a prospect in a better position than we found them! It could be you! What have you got to lose from contacting us?